The Silentaire AMP 50-24 Silentaire Oilless compressor offers exceptional quality and performance at a fraction of the cost of larger industrial air pressure units. Designed and engineered for optimal performance, the AMP 50-24 Silentaire Oilless compressor is constructed to ensure noiseless application. Quiet, dependable, and consistent in air pressure for seamless paint application, this compressor is manufactured for durability and reliability on the job. The silent choice for any air brush artist. The Silentaire Oilless compressor is scaled for easy portability, as well as low maintenance for smooth functioning. Silentaire compressor are equipped with a clean air system, allowing for continuous application without interruption caused by clogging or overheating. 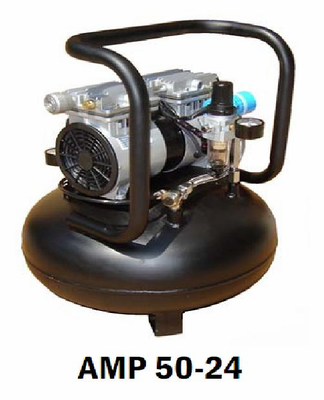 The AMP 50-24 comes with an air tank, tank pressure control, moisture reducer, line and tank pressure gauges, and secure valve, air flow filter and built-in engine cooling fan. In 110Volt/60Hz , 220volt/60Hz and 220volt/50Hz voltage units.